Beginning Tuesday, December 11, 2018, the front main entrance to the Robert C. Murphy Courts of Appeal Building will be open to the public following a year-long construction project. 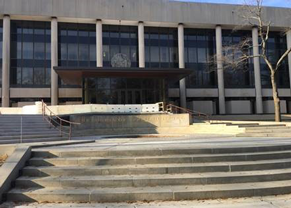 Access to the Court of Appeals, the Court of Special Appeals, and the State Law Library was limited for most of 2018, which forced visitors and employees to use the side entrance of the building. However, as the final construction phase comes to an end, all persons doing business with the courts or the library can begin using the front entrance. For those needing handicap access to the building, the ADA access ramp is located along the side of the building next to the lower parking garage. Please look for blue directional handicap signs. 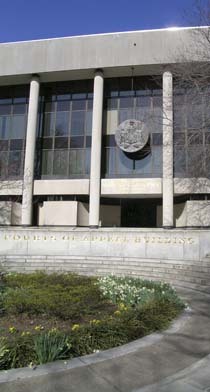 The Court of Appeals is the highest court in the State (commonly called the Supreme Court in other states and at the federal level). It hears cases almost exclusively by way of certiorari, a process which gives the court discretion to decide which cases to hear. However, the Court of Appeals is mandated by law to hear cases involving the death penalty, legislative redistricting, removal of certain officers, and certifications of questions of law. The Chief Judge, Mary Ellen Barbera, sits on the Court along with six other judges. All seven judges hear oral arguments on each case unless a judge removes him/herself from a case; in this event, a judge from another court, or a retired appellate judge, may be specially assigned to sit in the place of the recused judge.